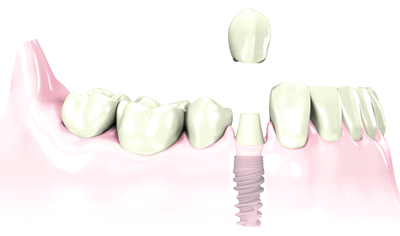 There is no better, long-lasting option to restoring a missing tooth than a dental implant fitted with a crown. This solution looks and functions like a natural tooth would. Traditional replacement of a single tooth using a dental implant is often completed over multiple visits. Placement of the dental implant, a substitute for the missing natural tooth root, either with or without a built-in abutment (a connector placed on, or built into, the top of the implant) that will attach to the replacement tooth. A temporary tooth can be placed while the dental implant integrates with your natural bone to form a strong foundation for your replacement tooth. Most people return to work the next day. Placement of the abutment, if one wasn’t placed during the prior visit. Placement of a custom-made crown, or replacement tooth. Consult with Dr. Cowden or Dr. Frye to find out if this is best course of treatment for you.